Recently travellers have been asking us about 2 day treks that aren’t the Inca Trail – since that trek is fully booked months in advanced. We have heard you and now we offer a 2 Day/1 Night Huchuy Qosqo trek. We will pick you up at your hotel at 5 AM and bring you to the beginning of the trek, which takes about 45 minutes. You will begin at the town of Chincheros. 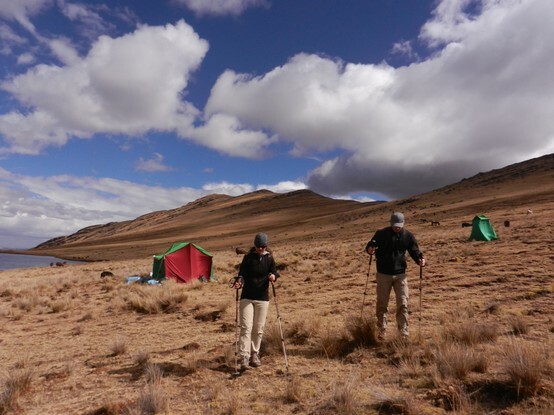 You will hike for about 7 hours this day – 2 hours gradual up hill to (4100 meters approximately), 2 hours gradual downhill to get to the Inca ruins of Huchuy Qosqo (3700). And then 2 hours of steep downhill to Lamay (2700 meters) in the Sacred Valley. There will be as many breaks as you need and a stop for lunch (totalling about 7 hours). You will then take a 45 minute drive to Ollantaytambo and have dinner there. You will take the train from there at 7PM to Aguas Calientes. Arrival Aguas Calientes will be around 9PM and we will bring you to your hotel. The next morning you can wake up when you prefer – but we do recommend that you wake up at 4:30 AM, have breakfast at 5AM and then take one of the first buses up to Machu Picchu at 5:30 to see the sunrise over the ruins. If you do not want to do this, its no problem, you can work it out with your guide – but our recommendation is quite beautiful. You will have your tour of Machu Picchu on the second day for about 2 hours with as much time as you will like after that to roam on your own. Lunch will be on your own that day and you can choose from the many restaurant options in Machu Picchu and then you will take the 2:55 PM tourist train back to Ollantaytambo (this is as far as the train goes) and then a bus transfer back to Cusco. We will bring you back to your hotel and you should be back around 7PM. Check join a group for open groups doing this tour at a discounted price.